As most know, I write in a method of contemplation from time to time. Not everything, obviously, but that is why Tessa’s journal is so personal to me because it shows her inner struggle, her highs and her lows and from that journal you get to know her. Odd enough, I don’t do daily journals for myself. I do snippets here and there but that’s about it. I was rummaging through some of my contemplation pieces from a few years back and figured I would share. It’s not got the happy theme so be warned, but I would think that at least a part of you could probably feel what I was feeling as I wrote it. Will you know if its fiction or reality? That’s the fun part and actually kind of irrelevant since once it transfers from the inner being to the paper it all becomes a part of its own world. I seriously have no clue how to feel and act anymore. My psyche is everywhere and although I feel deep and enlightened in bits and pieces, that quickly turns to a fog screaming emotions of fear, pain, anger, and sadness. Things have never been easy for me. It’s a destiny I have accepted as a constant. From time to time that brief moment of clarity I take as a strong advisement and the elation I embrace as long as I can for those are such a treasure in this sinking ship. In a world full of people, one would think of the ease it would be to make things proper; normal. Interaction is a primal need, humans have always been a social species. Social is by far something that is quite needed, especially for someone in such a state, but what happens when that has always been needed is what failed them in the past? What if every interaction, even those seemingly part of the elation factor, leads to one of damaging proportions and become part of the dreaded fog? Friendships turn sour, touching turns to pain, conversations warp the mind, and desires turn to devastation. Trust has died along with love; happiness a facade planted on a face to show the world that everything is perfect. Solitude seems a perfect answer until it is realized the need for social, an attachment, and an outside emotion is much needed. So is it masochism at its finest? The rock, the shell, the hole, a perfectly protected place; to leave it will guarantee pain, grief, agony, and despair. There really isn’t anyone or anything that can put a magic bubble around anything like that and I don’t care what a person tries to tell me. If it were that way then so many things in the world would not have been so harmful. The path set in front of us is only an illusion because the safe one that promises protection and the darker path that guarantees nothing but obstacles; they all lead to the same place and we are all in a grand delusional state to think otherwise. What does one do? How does one handle it? How far until the breaking point? What would the breaking point be and what would be the final blow that crushes it all? Only so much can be hardened, numbed, or blocked away before even that is overtaken. There is no real answer, and no need for pity. The truth in the matter is that I am just a bystander in my own life watching each derailment, unable to stop it. 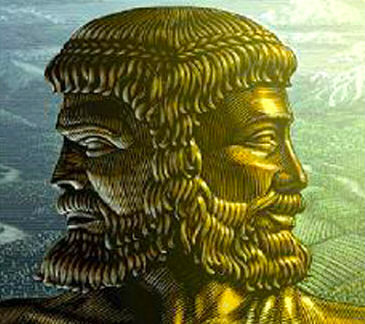 The faces of Janus know me by name with each passing moment that ticks through time.